Among those celebrating Customer Appreciation Day at H-E-B in Pleasanton were, left to right: Roel Garcia- Store Director, Ricky Lopez- Manager in Charge, Pauline Bosquez- Cashier, Aubrey Smith- Unit Director and Chad Parker- Store Director. 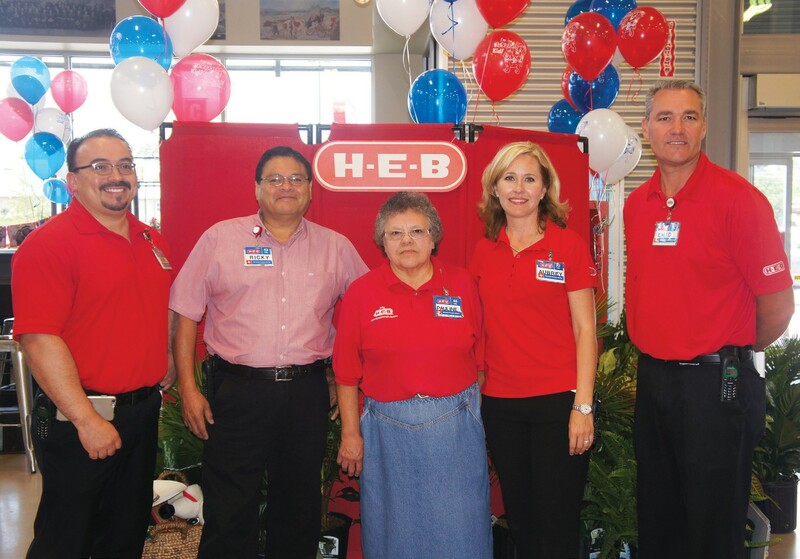 As a way of thanking its customers, H-E-B in Pleasanton hosted Customer Appreciation Day on Saturday, July 11. Aubrey Smith, Unit Director at the Pleasanton H-E-B, said the celebration marked the 45th anniversary of the store in Pleasanton. It also served as a grand re-opening for the newly remodeled and expanded Pleasanton location. The event began at 11 a.m. and the fun-filled activities continued into the afternoon. Outside the store, HE B Partners held a tasty Shrimp Boil and Team Chupacabra handed out fajita samples. Inside the store, the talented dancers of Ms. Tera’s Tap ‘N Toes entertained the crowd with two classic tap dances and two Broadway-style jazz routines. H-E-Buddy along with costumed-characters Keebler the Elf and the Pillsbury Dough Boy strolled through the store, taking plenty of photos with H-E-B Partners and customers. Also on hand were the Pleasanton VFD and Pleasanton Police Department, which provided free fingerprinting. Those attending also took turns dressing up and donning props for the photo booth. There were also gift baskets and a raffle drawing for a $100 gift card. Over $500 in prizes was awarded. Both the Pleasanton Cowboy Homecoming Court and Poteet Strawberry Festival Court joined the festivities. H-E-B Partners gave out goodie bags from a table set near the store’s entrance. Next to them was Alton Paris, owner of the line of Chupacabra Rub products. Smith explained that the Pleasanton store was the second ever to feature his products and it has now expanded to over 80 stores. The event was also the perfect opportunity for customers to see H-E-B’s selection of great products and updated departments. Smith explained that along with their items mentioned in last week’s Express, the Pleasanton store also offers new beer and wine selections, adding over 300 bottles to the department. 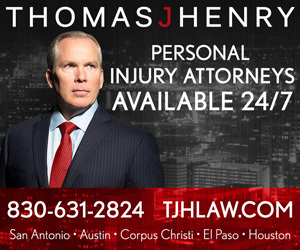 “Our Texas Backyard Department carries plants and other garden and outdoor items,” said Smith. “The store now has so much more space. We have really become a destination for Pleasanton and the area,” added Smith. She was pleased with the huge turnout at the celebration and thanked everyone who took part, especially the vendors. Participating vendors included : Pillsbury, Bud Lite, Miller Lite, Kiolbasa sausage, Team Chupacabra of S.A., Frito Lay, Mission Tortillas, Nature’s Own hot dog buns, Big Red, Coca-Cola and Boar’s Head. “We want to be sure to celebrate our H-E-B Partners, too,” said Smith. A collage banner featuring photos from throughout the years hung in the store’s dining area. Among them was a photo of H-E-B Partner Ricky Lopez- Manager in Charge, who has been with the store since 1970. Others who have served since 1970 include Pauline Bosquez- Cashier and Lupe Aranda- Market Specialist. Smith also wished to thank the five H-E-B Partners who put the event together: Tommy Cordova- Grocery Manager, Angela Arguijo- Administrative Assistant, Gwen Whitley Central Check-Out Manager, Kaycee Huizar- Cosmetics Manager and Rachel Garza- Shelf-Edge Manager.